Bhindi Masala / Okra Stir Fry in the Instant Pot or Pressure Cooker. A North Indian favorite – Okra cooked with onions, tomato, garlic and spices. Perfectly cooked with no slimy texture of okra. And guess what, ready in less than 20 minutes. 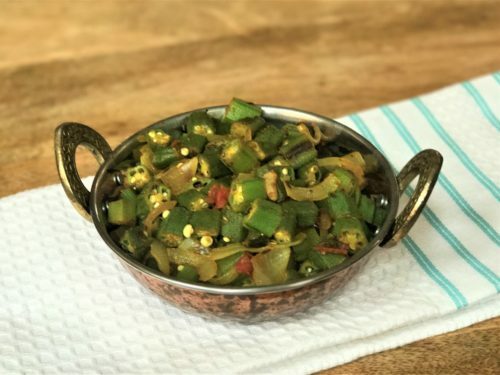 You can also call this okra recipe – Pyaaz waali Bhindi. Bhindi do pyaza, which is a popular dish in restaurants just means okra with double the quantity of onions. “do” means two in hindi and “pyaz” means onions. 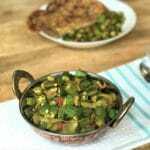 There are many ways to prepare okra. You can fry it or oven roast it. You can make it as a stir fry or make it as a curry. Another way is to air fry stuffed okra, and have it as an appetizer with mint chutney. 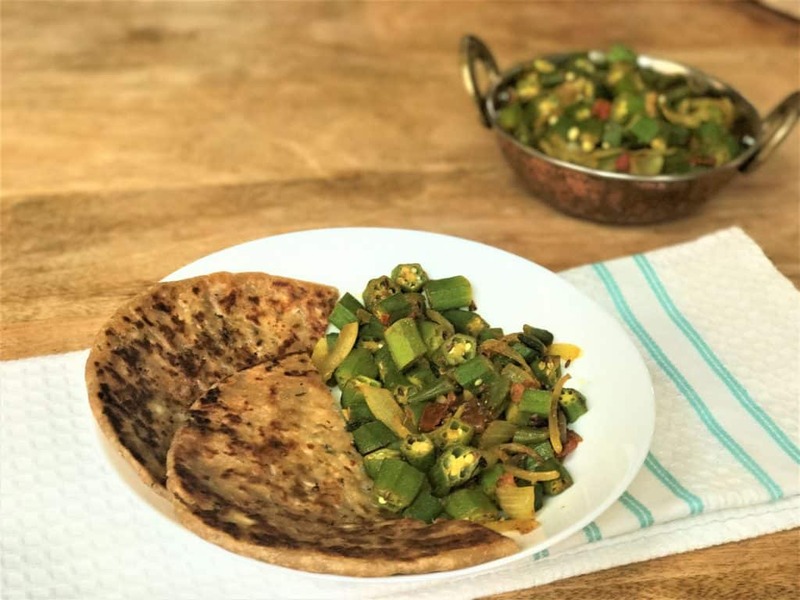 Here are two more ways to make okra – Kurkuri Bhindi (Crispy Fried Okra), Bharwa Bhindi (Stuffed Okra). Today I am sharing the simple okra with onions recipe made in the Instant Pot or Pressure Cooker. Okra cooks very quickly, hence we cook it on low pressure for only couple of minutes. This Bhindi Masala can be served with yogurt raita or lentil curry along with roti / naan. Fresh okra is best for this recipe, but you can use frozen okra when in a hurry. 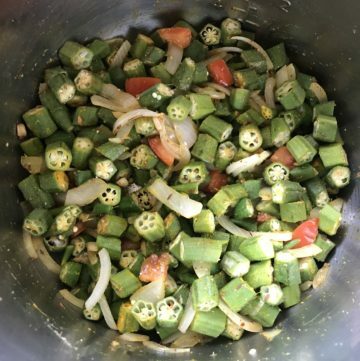 If using fresh okra, you want to wash it, and dry it completely before cutting. Too much moisture, makes the okra slimy and that is something no one likes. Cut the okra in small equal size pieces and slice the onions. 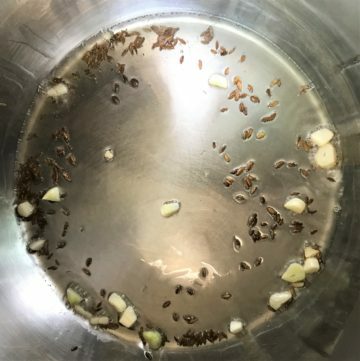 Heat oil in the instant pot and saute cumin seeds and garlic in it. Then add the sliced onions and saute for a few minutes till they slightly change color. Now add the chopped tomato, spices and okra. Give it a good stir and close the instant pot lid with vent in sealing position. Change the instant pot setting to cook on manual or pressure cook with low pressure for 2 minute. (On the Instant Pot DUO-60, you press the manual mode, then pressure to change the pressure setting). One important thing is to add something tangy to the okra. Tanginess helps to remove the slime from okra. I added tanginess with tomato and dry mango powder or amchur. You can add lemon juice if you don’t have dry mango powder. This is it! Now when you open the instant pot, okra masala will be ready. Give it a gentle stir and serve with roti, naan or parathas, along with a side of yogurt made in the instant pot. To make this recipe on stove top, check recipe notes. 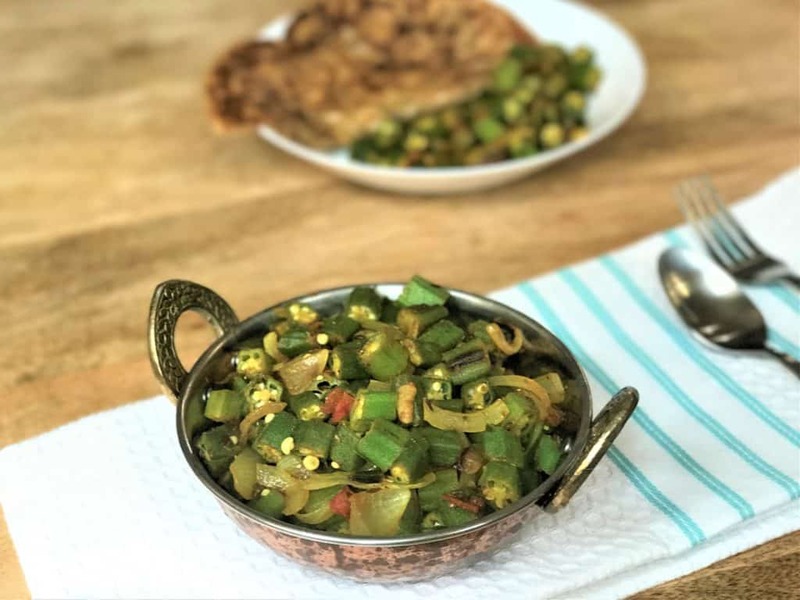 A North Indian favorite Okra Stir Fry in instant pot. Okra cooked with onions, tomato, garlic and spices. Heat the instant pot in saute mode and add oil to it. Add cumin seeds, garlic and saute for 30 seconds. 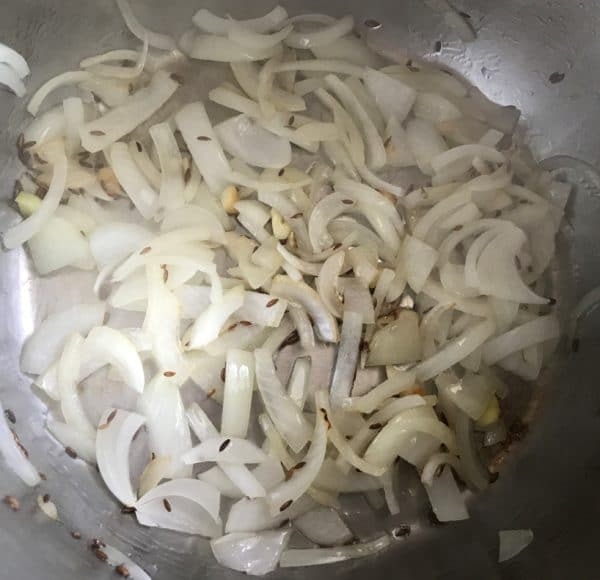 Add the sliced onion and saute for 3 minutes. Add chopped tomato, spices and okra. Mix well. Hit cancel and close the instant pot lid with vent in sealing position. Start the instant pot in Manual or Pressure cook mode for 2 minutes at low pressure. When the instant pot beeps, hit cancel and do a quick pressure release. Stir the okra gently. Leave open for 5 mins before eating. It is possible the instant pot may not come to pressure, but the okra is still cooking and will be ready in 2 minutes. If you don't have amchur, you can use 1 tablespoon of lemon juice. On the Instant Pot DUO-60, you press the manual mode, then pressure to change the pressure setting. To make this bhindi masala on stove top in a pan, follow the same steps. In place of pressure cooking, cover with a lid and cook for 5 minutes. Then open and cook on medium-low flame for 10 more minutes. I just made this! It was amazing and so simple. I never knew you could cook in the IP without adding liquid. Thank you! I am now a follower of your blog. Hi Nina – So happy to hear you enjoyed the Bhindi. I would love to hear if you try any other recipes! Can I make this without using any onions? Hey Sonia – Yes, that would work. Hope you enjoy it! This was delicious and super easy! Used 1/4 tsp tamarind concentrate instead of amchur and a can of fire roasted tomatoes. Hey Lori – Love to hear the variations. Thank you for sharing back your review! I have the lux mini and don’t have the option for low pressure. What do you recommend I do to cook the Bhindi? Hello – Sorry, I have only tried bhindi in low pressure cook setting. If you want, you can try 0 mins and quick release or just cook it on Saute mode (which is similar to cooking on stovetop). I didn’t notice the Low pressure recommendation and cooked it on high for the two minutes and it worked just fine. I have cooked behind I masala several times on the stove top, and I have to say the Insta pot variety is very tasty. I used a cup of Pico de gallo for the tomato. Also, the lemon juice worked fine. Hey Jude – So glad to hear that you enjoyed the Okra. Thank you for sharing back your review! I tried out this recipe and the okra tasted good 🙂 Minor concern is that my instant pot got a little burnt. Do you suggest splashing a little bit of water before I close the instant pot and let it come to pressure? Mine is the IP-DUO80. Hey Kiara – Glad you enjoyed the okra. I have heard from readers that 8qt typically needs more liquid than a 6qt, so I agree it will be useful to add a little water before cooking. Thank you for sharing back your review! How would it change if you also want to make it with beef cubes? Hey Charlene – Sorry, I don’t have much experience cooking with beef, so would be hard for me to give a good suggestion. If you can, please post in the Instant Pot groups on facebook and you might hear some experiences. I am loving your simple recipes to cook in IP. I got my mini yesterday and cooked green beans today using your recipe but for some reason my beans lost its vibrant green color. How do i retain that pretty green color of beans or okra like it would when i cook them in a kadhai on stovetop? Hello Prapti – Glad you are enjoying the simple recipes. Sometimes the greens do lose some color, but I have seen that most of them work really well. I cooked a aloo saag this morning with spinach and it was as green as could be. I suggest to try a quick pressure release to retain the greener color. Just wondering how/what would you change if I used frozen Bhindi? Cuz it would let out alot more water? Hey Naz…with frozen bhindi, you can let it come to room temperature and preferably remove extra liquid using a paper towel. Then follow the recipe. I know it is a little extra effort, but certainly better than mushy bhindi. Hope that helps!